Rain continued to move through the Chicago area Friday and the ABC7 Storm Tracker went out to check road conditions. 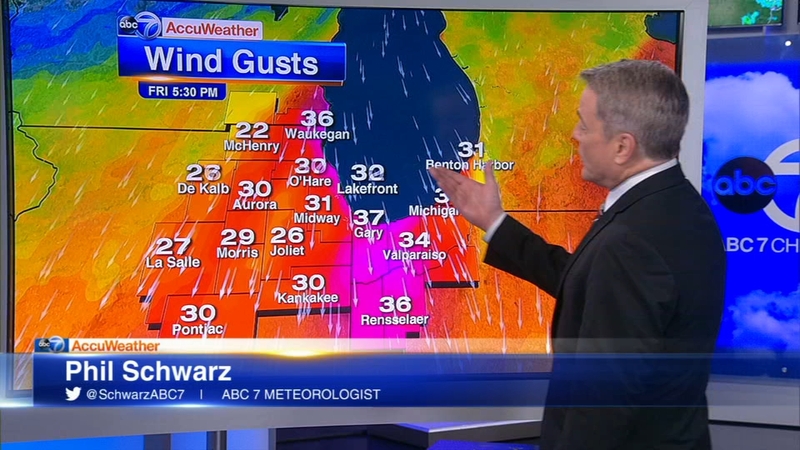 CHICAGO (WLS) -- Storms rolled through the Chicago area Thursday night and Friday morning. A line of storms approached from the west and moved through northern Illinois and northwest Indiana between 8 p.m.-1 a.m. Heavy rain is expected to continue until about 6 a.m. Lingering drizzle could persist in Illinois through 6-7 a.m. The ABC7 Storm Tracker checked out road conditions on the westbound on Eisenhower, where there were some wet spots, but no major concerns for drivers heading into work Friday outside of some standing water on the inbound side in the left lane near Harlem Avenue. Friday will remain windy and chilly, with a high of 52. A Wind Advisory will go into effect at 10 a.m. for all of northern Illinois and expire at 8 p.m. Wind gusts of up to 40 miles-per-hour are expected. The Cubs moved up Thursday's start against the Pittsburgh Pirates by 30 minutes as a result of the forecast, the club tweeted. The game started at 6:35 p.m., with gates opening at their originally scheduled time of 5:05 p.m. There's a great temperature disparity between the northern and southern parts of Chicagoland: The northern suburbs and lakefront will stay in the 40s and low 50s while the south suburbs and anywhere south of I-80 could reach 70 degrees in the afternoon.